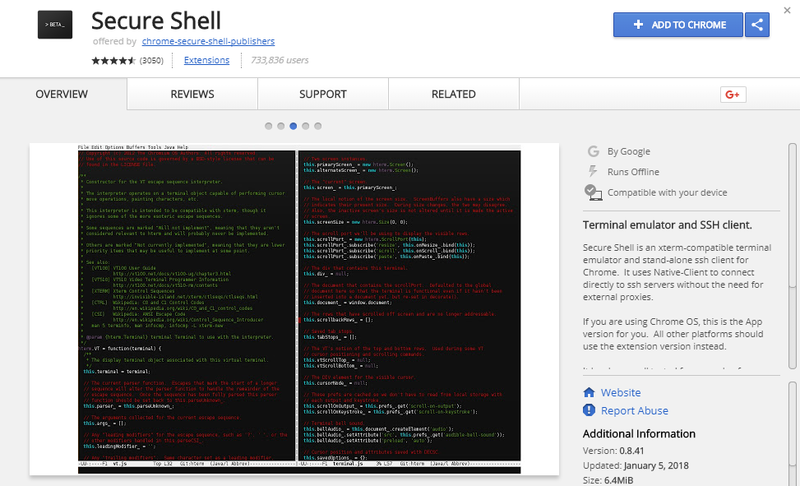 This Google Chrome Browser Secure Shell Chrome Application provides PuTTy-like functionality. 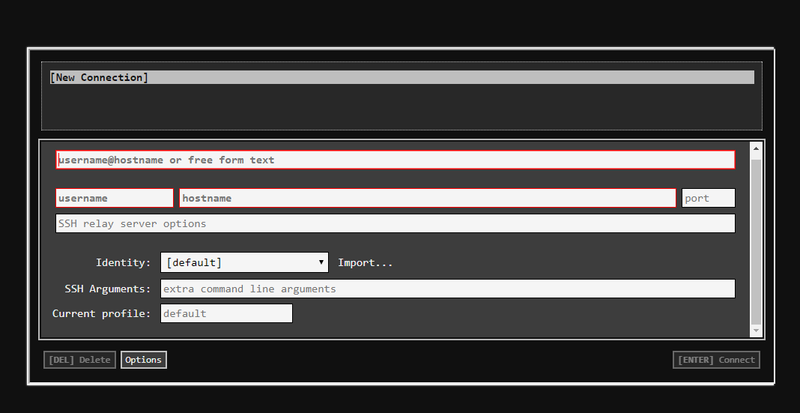 This application is stand-along SSH client for Chrome and xterm-compatible terminal emulator. It works by combining SSH command ported to Google Native Client with hterm terminal emulator which allows this application to provide a Secure Shell Client within a browser without relying on other external proxies. This application works great within few minutes you’re able to establish an SSH connection from your Chrome browser obviously after downloading and installing it first. To begin using Google Chrome Browser to SSH into Remote Devices we’re going to first download and install our Application. After navigating to Download Link, click on “Add To Chrome” button on top right-hand corner of the popup window. Following that, a dialog window will appear asking you to confirm that you want to add the app. Click “Add Application” to install the application. In addition, you can also open the SSH app by navigating to the apps screen. This can be done by opening a new tab in the Chrome browser and clicking on “Apps” in the top left-hand corner or putting chrome://apps/ into the search bar at the top of the screen. 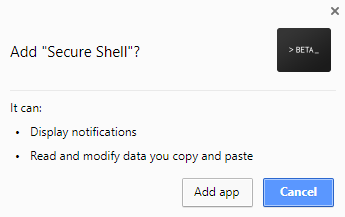 Once there, you should see the “Secure Shell” icon in your list of apps. Click the icon to open the app. Another easiest method to open Secure Shell is to simply type “SSH” into address bar at the top of the browser, then press space and enter [email protected] which will directly open secure shell tab. Since, we have a running Secure Shell application open and running, It’s simply to establish an SSH connection. You simply need to navigate to chrome://apps/ and click on “Secure Shell“. Now, Enter your new connection details the box which says “[email protected] or free-form text.” This can be anything you wanna name your connection server. After that enter username and hostname and then connect it will ask you to enter password by doing that you’ll be connected to your SSH device through Chrome browser.